Offering you a complete choice of products which include stock blenders. We are engrossed in offering excellent quality Stock Blenders to our esteemed clients. Our stock blender helps in uniformly mixing the rubber material and chemical ingredients. 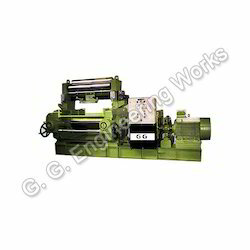 It reduces the cycle time operator fatigue, as he has not to do any cutting or folding job on the mill. It lowers the material temperature and improves the shelf life of the compound. The speed of the stock blender can be changed to get consistent quality of compound.